Check out Tobi's Fran Striped Off Shoulder Dress The bodycon dress for day: it works for us. 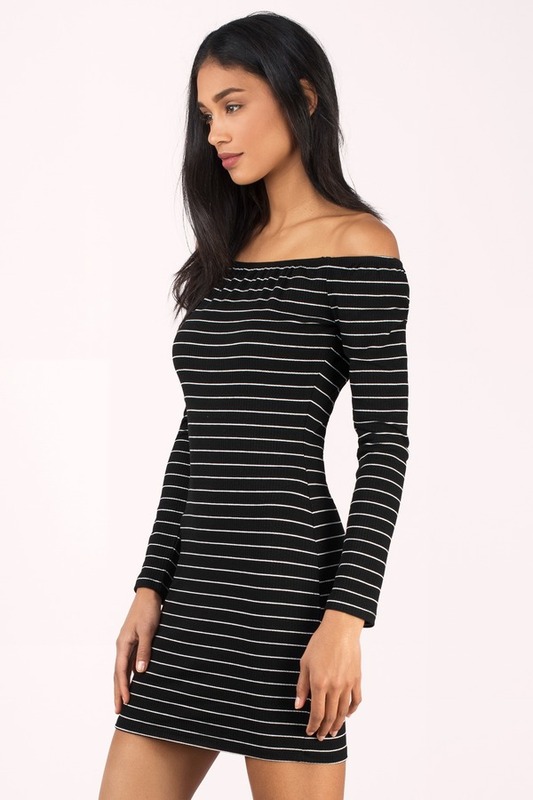 The Black Fran Striped Off Shoulder Dress comes in a stretch cotton poly knit for a figure hugging look, with horizontal stripes all over. With a bardot neckline, this mini sweater dress has long sleeves to take the yacht dress into fall. The bodycon dress for day: it works for us. The Black Fran Striped Off Shoulder Dress comes in a stretch cotton poly knit for a figure hugging look, with horizontal stripes all over. With a bardot neckline, this mini sweater dress has long sleeves to take the yacht dress into fall. The bodycon dress for day: it works for us. The Grey Fran Striped Off Shoulder Dress comes in a stretch cotton poly knit for a figure hugging look, with horizontal stripes all over. With a bardot neckline, this mini sweater dress has long sleeves to take the yacht dress into fall.